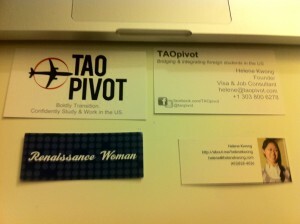 My two business cards: one for TAOpivot, the other for just me. No matter what career you are in, you need a business card to represent you and your brand. In the past couple weeks, I’ve been to a wide variety of networking events: creative small businesses, tech startups, nonprofits, etc. At every event though, there was at least one person who did not bring their business card/did not have a business card period. I know, I know, not everyone has their cards on them all the time, but we should start implementing this as a habit, a norm. If you’re a job-seeker, small-business owner/entrepreneur, or freelancer, here are some steps to getting your own cards for your next social/networking event. Visit Vistaprint or MOO to order business cards – (NOTE: These are completely un-sponsored recommendations). Vistaprint almost always has deals for first-time buyers; MOO is good for high-quality card stock and flashier design templates. I have ordered from both companies before and I am satisfied with both (see my cards above for examples from both companies). With Vistaprint, you do get more bang for your buck though, so keep that in mind if you want to buy your business cards in bulk (500+ cards). Decide if you want double-sided or one-sided cards – This is all based on personal preference: I ordered double-sided cards for both my business and for myself; I just sifted through my pile of cards from colleagues and seems that more and more folks are embracing both sides of the business card. If you are on the fence about this, just ask yourself: Can I fit all my information on one side? Do I want a flashy design? Do I have a logo for myself that I want to use? Decide if you want regular-shaped cards or something ‘out-of-the-box’ – Most people go for the regular-shaped cards. Some like MOO’s mini-cards or even circular cards. I would stay clear of going for odd-shaped cards, though; sure, these may make great impressions on others, but it may also be cumbersome since it won’t fit properly in a business card holder. Include all relevant contact information on your card – Last but not least, make sure when you’re planning out your card that you remember to include the important details! Generally, a business card should have: your name, your phone number, your email address. If you have a website that can be used as your portfolio, include that as well. Other information to consider: your job title (if available), social media profiles, logo (if available). There! Now you have your business cards ready for the next networking event in town! Having business cards will give you an extra layer of confidence when mingling with others: after all, if you meet a possible business connection/employer, you will be able to give them your card (and they can do the same). Follow-up will be much easier so you both remember where you met and what you plan to collaborate on. Even though I met some people without business cards these past few weeks, I gave them my card. Whether they will follow up or not is a question I have on my mind…and, since I do not have their cards, I won’t be able to follow up with them myself.